When Samsung lost the $1 billion patent case to Apple everyone thought that it would go on to affect the sales of the Korean giant’s flagship Samsung Galaxy S III. But interestingly it seems that it is the other way round. 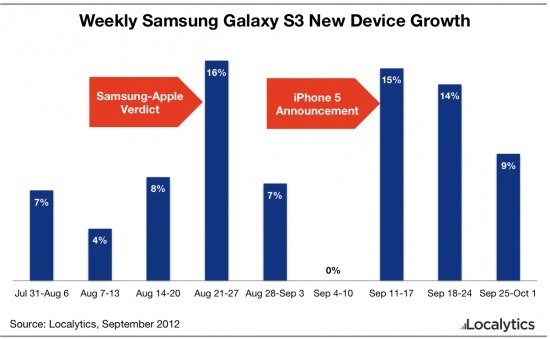 Instead of affecting the sales of the Galaxy S III, Localytics notes that the sales of the smartphone actually rose by 16% during the week of the verdict. We don’t know the reason of the increase in sales but probably the verdict got the Galaxy S III more exposure than causing any harm that Apple would have expected. Leaving the verdict behind, the announcement of the Apple iPhone 5 was thought to again affect the sales of the Galaxy S III but it seems again it didn’t happen as we all had thought. If Localytics is to be believed, then during the Apple iPhone 5 announcement week the sales of the Galaxy S III rose by about 15% which is again huge. So what could be the reason behind it? Unhappy Apple iPhone owners who were expecting much more from Apple who later decided to move over to the Galaxy S III? Possible! Also how can we forget the different means of advertising that Samsung used after the announcement of the iPhone 5? Remember the ‘It doesn’t take a genius’ specs comparison and the iSheeps (as Samsung calls them) standing in line to grab an iPhone? All in all, it seems that Samsung has only gained and only sold its Galaxy S III like hotcakes and that too at Apple’s expense.